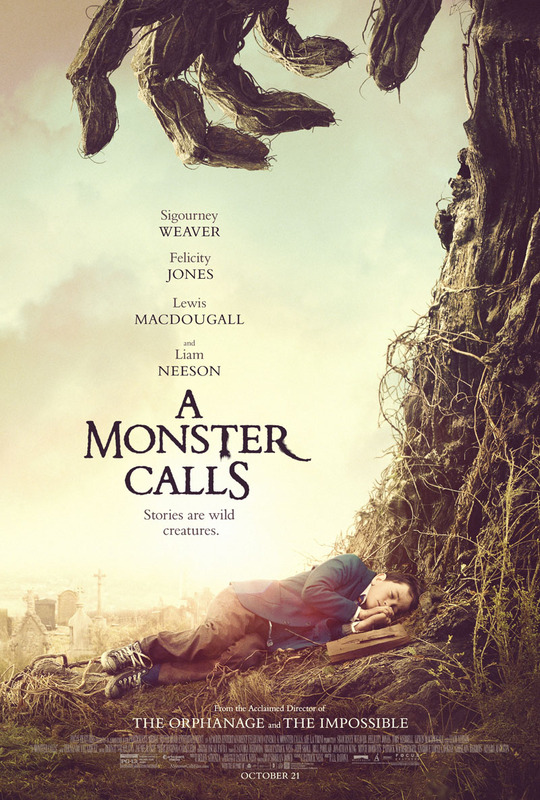 Based on the fantasy novel for children of the same name by British author Patrick Ness, A Monster Calls tells the story of a young boy named Conor O'Malley (Lewis MacDougall) whose entire world is turned upside down when he is visited in the night by a giant tree monster (Liam Neeson). Plagued by a recurring nightmare and the torment of a waking life peopled by his terminally ill mother (Felicity Jones), domineering grandmother (Sigourney Weaver), and estranged father (Toby Kebbell), the new film directed by acclaimed Spanish filmmaker J.A. Bayona (The Impossible) promises to turn heads come time of its late October release. Adapted for the screen by the original book's author Patrick Ness, A Monster Calls already looks promising based on the international trailer. What's more, the film's cast is so star-studded with tested screen talent that it is more likely than not that Bayona will have a real hit on his hands when his new movie finally sees theatrical release later this year - and the film's latest trailer promises even more wonder and awe than what has been seen before. In the latest full-length trailer seen above, Conor's quiet English countryside existence is put to the test when Neeson's towering tree-man makes his stunning motion-capture appearance, thus serving to set the stage for quiet the fantasy film to please viewers of all ages. Bayona has seemingly outdone himself with his latest feature production, which the Spanish director claims (according to USA Today) should be seen as, "An homage to what we do as filmmakers: The stories tell us the truth. There’s no truth in reality. Reality is just a fact, there’s no logic or justice." If everything continues to fall into place leading up to the theatrical release of A Monster Calls in a few short months then viewers the world over might just be in a for a real treat when Bayona's new genre film is finally greeted by general audiences. Ness' original book won both the Carnegie Medal and Greenaway Medal for children's literature upon publication in 2012, which is nothing short of being a good omen for the ultimate reach that Bayona's film could have with potential viewers. Everything seen thus far from A Monster Calls paints quiet the thrilling picture of the fantasy epic soon to come, and Neeson is a true marvel in the role of the titular monster. He might not be quiet as immediately charming and idiosyncratically effusive as Marvel Studios' Groot, but Bayona's tree beast appears to have a few tricks up its sleeve that will serve to enthrall the senses and calm even the most troubled human soul. A Monster Calls will see theatrical release in the U.S. on October 21, 2016.